As the designer and owner of Wildly Florals, Josi Stone derives inspiration from the movement and beauty of the natural world. No living thing remains still, and in that she sees incredible beauty. Each bouquet is a way for Josi to bring a little bit of that outside beauty into our homes. Using an expert knowledge of seasonal flowers and an eye for beautiful arrangements, Wildly Florals offers fresh, local blooms in each bouquet. Josi often used flowers from Coeur et Sol’s urban farm to create gorgeous, seasonal arrangements for our customers. Their bouquets can also be seen decorating tables in several restaurants throughout Essex County. 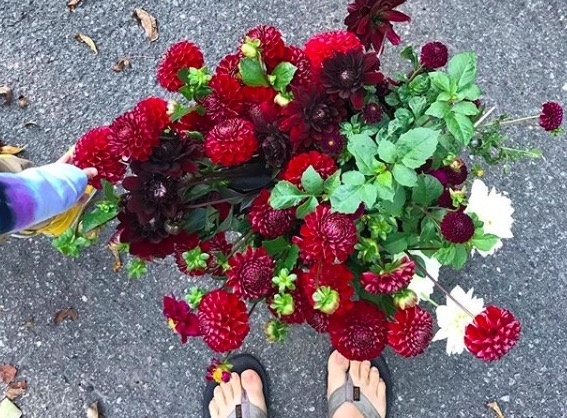 Moving into winter Wildly Florals will be sourcing local & seasonal greenhouse blooms like hellebores, ranunculus, poppies, and more to keep bringing us beautiful flowers all year. These specialty cut flowers are selected and arranged by Wildly owner and designer Josi Stone and grown right here in Northern New Jersey. Josi sources these Winter blooms from a family-run farm that has been growing unique, exceptional flowers since 1902. Wildly Florals is a full service floral design studio based in Maplewood, NJ. Their shop offers seasonal bouquets, wreaths, and flower crowns for any occasion.